Suddenly under fire from an entire middle school band squeezing its way through the gates of Coolray Field, Patrick Barlow dishes out programs with the deft calmness of a seasoned veteran, sharing hearty grins and big laughs along with them. 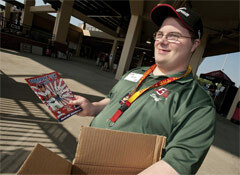 The 28-year-old Stone Mountain resident — who has Down syndrome — has been with the Gwinnett Braves all along, starting his job as a greeter with the Atlanta Braves’ Triple-A affiliate when it moved down from Virginia in 2009. He welcomes G-Braves fans to every home game with a pure and unparalleled joy. The reputation is earned from sheer enthusiasm for the job. Barlow stands vigilantly at the end of a table at the main entrance to Coolray Field, emphatically barking out cheers and welcomes to each and every game-goer. Season ticket holders give him high fives and tell him how happy they are to see him. The only thing that puts a wrinkle in Barlow’s bespectacled brow is when the occasional fan turns down his offer of a program. Just don’t disturb him during “The Star Spangled Banner” — the patriotic American dashes from his post as the national anthem starts prior to each game, standing faithfully at salute for the duration (“It’s what the Marines and Army and those guys do,” he says). “Everyone on our staff looks forward to seeing Patrick at the ballpark — he is always excited to be here and our fans love his contagious enthusiasm,” G-Braves General Manager North Johnson said. Barlow will tell you he truly loves all of the Braves, both in Gwinnett and Atlanta. His favorites, though, represent somewhat of a dichotomy — Jason Heyward, the highly hyped new face of a big league franchise, and Diory Hernandez, a 27-year-old journeyman seemingly on a perennial carousel ride from Gwinnett to Atlanta and back. Then again, the G-Braves’ greatest greeter has also been his own person. The Gwinnett Braves staff in general is one close-knit with its fans, particularly its regular visitors. One of the first jolly faces fans see at Coolray Field, Barlow succinctly explains what those relationships mean. “I make a whole bunch of friends,” he said, with the biggest grin of all.